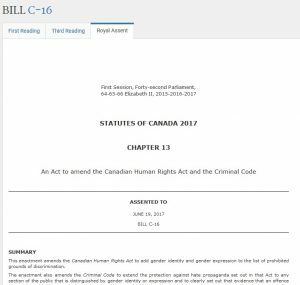 C-16, an Act to amend the Canadian Human Rights Act and the Criminal Code, became law on June 19, 2017. This new law criminalizes speech and actions related to sexual orientation, and gender identity or expression. Canadians now can either be brought before the Human Rights Commission or face criminal charges for failing to use the correct gender pronoun. C-16 violates the traditional biological identity based on male and female, and reinforces the political correctness culture. In addition, Canadians are now forced to ascribe to progressive gender theory or face the legal consequences. ● Rescind C-16 by removing “sexual orientation, and gender identity or expression” from the Human Rights Act and Canadian Criminal Code. The National Citizens Alliance supports all Canadians, but at the same time, we as a party reject political correctness and unnecessary burdens like C-16 on the Canadian people. All Canadians’ fundamental rights are protected under the Canadian Charter, Criminal Code, and Human Rights Act. C-16 is excessive and unnecessary. The NCA membership vote to be determined. The vote outcome must satisfy a minimum 70 percent membership support and 50 percent quorum as required for adoption of policies as per the National Advancement Constitution.